Are your spices older than your kids? Seriously. A few years ago a long time family friend invited us over for cocktails. After a fun evening of catching up with each other’s lives, we jumped on the topic of my new organic spice line, cooking class business, etc. Our host quickly offered to show me her old set of organic spices. They were apparently from a Pacific North West spice company, and at the time they thought the whole concept of organic spices was groundbreaking because so few quality companies were (and still are) out there. When she emerged from her kitchen, she brought with her a huge decrepit white box, with about 30 spices all in various states of use. She had them for at least 20 years and said this particular spice company was amazing, but they are now out of business. I commended her for keeping the spices after all this time, but I was a little surprised- no wait, a lot surprised! I asked her if she still used them and she said no, not anymore, really…but sometimes… We both got a laugh out of it; the fact that she held on to these spices, in her kitchen, in the box for such a long period of time. I wondered what the psychology was behind it, but decided that was probably futile. Now that I make spices day in and day out and know a bit more about their longevity so let’s talk about when to part with them and refresh your supplies. Spices, in general, lose their efficacy (think turmeric’s anti-inflammatory properties) over time. The flavors and health benefits diminish, and they are no longer flavor enhancers. But they are costly, and no one likes the idea of wasting exotic, sometimes expensive condiments. So let’s take a moment to explore when to part with them and determine spices you can keep a longer than others. 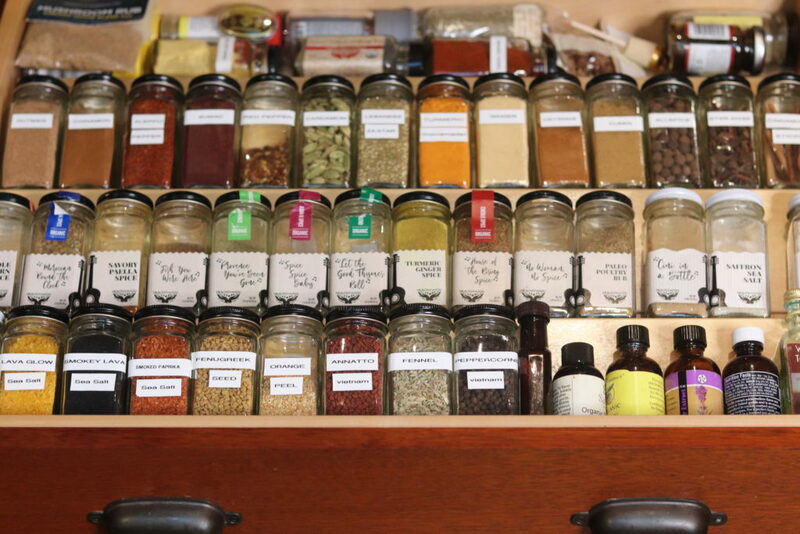 But first things first- aggregate all the spices in your pantry and set them on your counter. Check expirations dates of each one. Organic spices are required to have a lot/batch #, and usually, these lot numbers are listed a year or two from the date they were manufactured. Non-organic spices are less regulated so look carefully and if there is no expiration date, set it aside. Go ahead and toss the expired spices and for the ones without an expiration date, use the smell test. If you can’t immediately identify the main ingredient(s) when you take off the cap, then your spice has lost some of its flavors and is past its prime. With the remaining unexpired spices, I would still give them a sniff and check for mold. If you are like me, you may have multiples of the same spices. If they are all still good, meaning they smell great and aren’t expired, go ahead and combine them. You can also venture to make some fun combinations with spices that are almost at their end. This is a great space-saving idea. Solid spices like cinnamon, allspice and star anise if sealed in an airtight container can last a long time but if you know you have had them for a year or more, try toasting or grinding them to punch up the flavors and incorporate in a blend before use. Remember too, you should always aim to purchase the best quality organic herbs and spices. Shop your favorite blends now at Healthy On You®. I organized my own spice draw!